Arms: Gules, on a pale Argent, the Chinese characters 行, 有, 木, and 扳, pronounced as Háng, Zài, Mù, and Lā in the Mandarin dialect Sable arranged palewise. Crest: on a crest coronet Or atop a barred helmet affronty Argent a Latin cross Or. Supporters: a Tungus warrior holding a bow in his dexter hand and a spear in his sinster hand natural, sinister, a Tungus warrior holding a spear in his sinister hand and an arrow wards downward in his dexter hand and with a bow slung over his shoulder natural, both standing on a compartment of numerous crossed tree branches Vert. Robe of Estate: Gules lined Ermine, decorated with tassels Or, surmounted by a crown of a Russian Prince. Note: the blazon is based on the one recorded in Armorial général de la noblesse de l'Empire russe, volume XVII, p. 7 (online version: http://gerbovnik.ru/arms/2758.html) but has been corrected by The Chinese Armorial for in the blazoning of the four Chinese characters, which were erroneously blazoned as “four Manchu marks meaning ‘khan’”. Grant: Office of Heraldry, Russia. The Gantimurov (Гантимуровы) is a Russian princely family descended from the Tungusic Evenk or Mongolian Daur prince Gantimur (whose name is also transliterated as Ghantimur or Gan Timur. Chinese: 根特木; Russian: Гантимур). His name was derived from the Mongolian words Gan (steel) and and tömör (iron). Gantimur left his homeland in Siberian in the Russian Empire for China in 1653 to avoid Russian demands for tribute.1 Both Russia and China valued Gantimur and his warriors for their powerful military skills, so the Qing gave Gantimur a mandarin rank. Gantimur served in the Qing army in the siege against the Russian fortress of Kumarsk in 1655. The Kangxi Emperor sent envoys to Russia to demand that the Russians return Gantimur to China, but the Russians refused these demands. In 1675, Russia sent an embassy, led by envoy Nicholai Milescu Sparthary (also known as Nikolai Gavrilovich Spafarri) to Beijing to negotiate diplomatic relations and trade, especially in fur. The embassy failed primarily because the Russians refused to return Gantimur to China3. The Russians were not holding Gantimur against his will. Sparthary had asked Gantimur if he would return to China, and Gantimur pleaded for the Russians not to give him back to China, saying that he feared that the Chinese would kill him before he reached Beijing4. Sparthary guaranteed that Russia would never send Gantimur back to China. Gantimur would spend the rest of his life as a subject and nobleman of the Russian Czar again. In 1684, Gantimur was baptized as a Christian into the Russian Orthodox Church and became a Russian nobleman with the title and name of Prince Peter Gantimurov. The four Chinese characters translate to, from top to bottom: to walk, to exist, wood, to pull. They do not have a meaning if they are read as a Chinese phrase or sentence. If they are pronounced in Mandarin, they would sound as “xíng zài mù lā”11, so the four characters are not a phonetic transliteration of the name Gan Timur into Chinese characters if pronounced in Mandarin. However, it is very possible that the four characters are a phonetic transliteration of the name Gan Timur if the characters are pronounced in an Evenk or Mongolian language or dialect (Some East Asian cultures used Chinese characters but with their own pronunciations in written language.). The supporters represent the Tungus origins of the family. The crest, which is a gold Latin cross, symbolizes the family’s Christian faith. 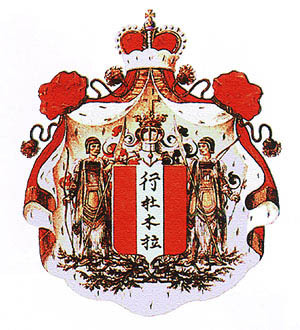 The Chinese Armorial thanks Mathieu Chaine, Zaza Kiknadze, Ulyßes Lutetiæ-Berolini, Charles Thibaut de Maisières, Adrian Mak, Michael Y. Medvedev, Susan Smith-Josephy, and Tomasz Steifer for their assistance in researching the history of the family and arms of Gantimorov. 1 Perdue, Peter C. China Marches West: the Qing Conquest of Central Eurasia, Harvard University Press, Cambridge, Massachusetts, U.S.A., 2010, p. 165. 2 “Some Account of the Tungousians in General, and the Transbaikal Tungousians in Particular”, The Asiatic Journal, June 1824, Volume 17, p. 594, London, U.K.
4 Sladkovskii, M.I. History of Economic Relations Between Russia and China, translated from Russian to English, Israel Program for Scientific Translations, Jerusalem, Israel, 1966, p. 13. 5 Some of the history of Gantimur or Prince Peter Gantimorov is from his biographical entry in Eminent Chinese of the Ch’ing Period, by A.V. Iiarakueff, edited by Arthur W. Hummel, Sr., published by the United States Government Printing Office, 1943. 6 Per correspondence with Michael Y. Medvedev, October 3, 2014. 7 Per correspondence with Michael Y. Medvedev, October 3, 2014. 9 Per correspondence with Michael Y. Medvedev, October 3, 2014. 10 Per correspondence with Michael Y. Medvedev, October 3, 2014. 11 Per correspondence with Ulyßes Lutetiæ-Berolini, October 3, 2014.